News | Amazing news about MARCH: BOOK ONE! 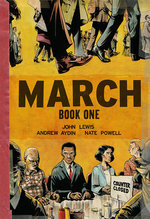 You may remember our earlier announcement of March, the graphic novel trilogy by US Congressman and legendary civil rights icon John Lewis, co-written by Andrew Aydin and drawn by Nate Powell. Now, after many months of preparation, March: Book One is officially ready for pre-order to comic shops through this month's Diamond Previews -- and to celebrate, we have some incredible news to share! President Bill Clinton on MARCH! "Congressman John Lewis has been a resounding moral voice in the quest for equality for more than 50 years, and I'm so pleased that he is sharing his memories of the Civil Rights Movement with America's young leaders. In March, he brings a whole new generation with him across the Edmund Pettus Bridge, from a past of clenched fists into a future of outstretched hands." We are also delighted to announce that Congressman Lewis will appear on Comedy Central's The Colbert Report to promote March on its release day, August 13th! Not long thereafter, he'll head to CNN for State of the Union with Candy Crowley! Comics luminaries such as Joe Quesada, Neil Gaiman, Garry Trudeau, and Marjane Satrapi have appeared on The Colbert Report, but this is the first time a guest has been invited specifically to promote a graphic novel on this hippest of late-night shows. Plus: catch him streaming live at 5 PM this Friday, May 31, on Huffington Post Live... and stay tuned for more media updates! One of Congressman Lewis' chief goals for the March trilogy is to engage the next generation of readers, in order to keep the lessons of the civil rights movement alive. So Top Shelf is proud to present an 11-page Teacher's Guide to March: Book One, developed by comics/education expert Peter Gutierrez, packed full of resources for using this graphic novel in the grade 6-12 classroom and beyond. It even includes correlations to national & state standards for English and Social Studies! Teachers and librarians can download this guide today, absolutely free, and get ready to teach March: Book One in the fall. Many more appearances, including festivals and in-store signings, will be announced shortly! March: Book One comes out in less than three months -- which means you can now pre-order it from your favorite retailer! So let your bookseller know how important this book is to you, and help us launch this landmark graphic novel with as big a splash as possible. March: Book One, a deluxe softcover graphic novel with french flaps and black & white interiors, 6.5" x 9.5", 128 pages. -- Release Date: August 13, 2013. For more information and a 14-page preview, visit http://www.topshelfcomix.com/march.